Where would we be without traffic control planning for California construction zones? Probably wedged in among miles of gridlocked cars and trucks. No doubt about it. The ability to travel Southern California depends on maintaining a smooth flow of vehicles as well as pedestrians, especially in and around construction zones. As any driver knows, the situation can get real dicey in these high-activity areas. It takes a top-notch outfit like Roadway Construction Services (RCS) to supply the tools and personnel able to ensure smooth traffic flow in construction zones. 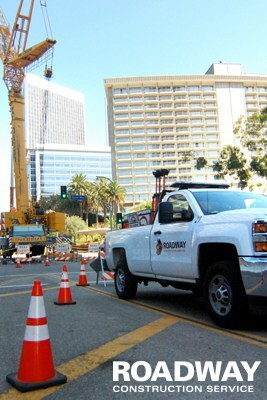 Providing traffic control in California construction zones makes enormous demands on our team. Consider the swarm of vehicles moving through the state, day and night. North, east, west, and south. Now throw in throngs of pedestrians headed in all directions. How do you keep the mass flowing in the vicinity of construction zones — while simultaneously assuring the safety of workers, drivers, and pedestrians? A lot for anyone’s plate. But then, dealing with full plates is what RCS is all about. That’s why when our staff gets the call, we deploy a high level team unrivaled for efficiency and reliability. It all leads to one result – safer, smoother construction zones and happy motorists able to travel Southern California without frustration. Successful California traffic control doesn’t come about spontaneously. To pull off this feat, the RCS staff must do mountains of homework. This involves digging up facts, planning maneuvers, and securing those all-important authorizations known as permits. Yes, nothing moves forward without appropriate permits from the powers-that-be – city officials, business entities, etc. All the major players who have a stake in the RCS effort. To our credit, RCS has built such widespread trust that we have the instant ear of virtually all municipal decision makers. When we approach these VIPs for permits, they’re more than ready to accommodate. Which invariably expedites the permitting process and gets the ball rolling in record time. No frazzled nerves on the part of clients waiting an eternity for permits. When RCS tackles traffic control permitting, consider it done … yesterday. Not that we can’t be spontaneous when we must be. Sometimes emergency circumstances arise, requiring unplanned action to service construction zones. That’s when our team shifts into high gear, deploying maximum force to protect these problem areas as well as all surrounding regions. But our on-site crews aren’t the only people involved. Also playing a vital role are the live personnel commandeering our traffic control center. Trained to route urgent calls to our emergency team in the blink of an eye, they’re available 24/7/365, including holidays. This means you’ll never get a recorded message when eyeball-deep in an emergency. What you will get is rapid response and peace of mind. Clearly, RCS is prepared for a wide range of needs when it comes to traffic control in California’s construction zones. Emergency or routine, planned or unplanned. Thanks to our efforts, expertise, and experience, the ability to travel Southern California without a hitch is something many a motorist can count on. If you’d like to learn more about our acclaimed California traffic control for construction zones, contact Roadway Construction Service today. You’ll discover one more reason why we’re the go-to traffic control service in Los Angeles County, Orange County, Riverside County, Ventura County, San Diego County and all of Southern California.